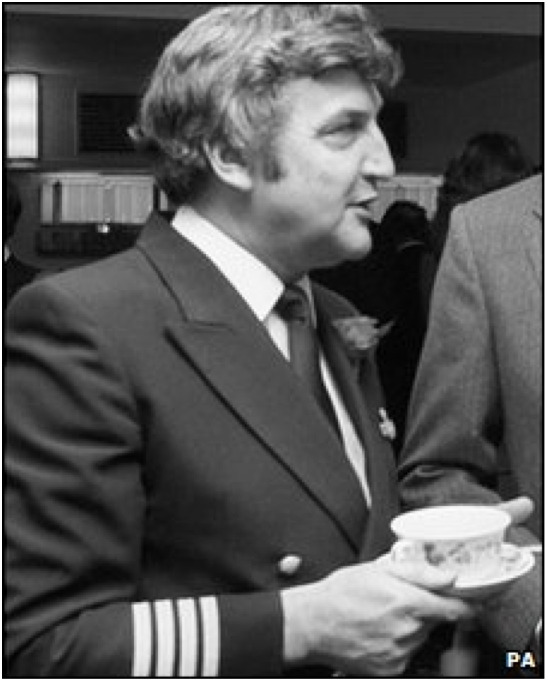 It is the 24th of June, 1982, when Captain Eric Moody takes his left seat in the cockpit of a Boeing 747 being flown as British Air Flight 009. The weather is good, with a clear sky, and the crew prepares for an overnight flight from Kuala Lumpur to Perth. In addition to the crew, 239 passengers are on board the jumbo jet (whose registration number is G-BDXH). As the passengers are about to start watching the movie “On Golden Pond,” a major catastrophe begins to envelop the plane. No one on board knows it, but around 110 miles away—on the island of Java—a volcano, known as Galunggun, is erupting. The eruption is huge. It is spewing-forth a massive cloud of volcanic ash. The wind carries part of that massive cloud of ash from the volcano to at least 35,000 feet—nearly the same altitude as Captain Moody is flying his 747 (whose call sign is "Speedbird 9”). The cockpit crew members suddenly see what appears to be particles flying all around their windshields. Window-seat passengers see an erie light, surrounding the plane, and observe that the four engines seem to be glowing. People begin to witness what seems to be 30-40 feet of flames following each engine. Passengers begin to worry. Is their plane on fire? Then ... Engine 4 stops. After Engine 4 fails, the crew experiences another stopped engine. Then another. Then another. Within 90 seconds, the plane has no working engines. Mayday, Mayday. Jakarta control. Speedbird nine. We have lost all four engines. Repeat, all four engines. Now descending through flight level 3-5-0. Other systems, in the plane, are also failing. With passenger oxygen masks dropping, Moody tries to summon his chief flight attendant, Graham Skinner. He cannot do it because the internal communication system has failed. Instead, he’ll need to use the public-address system. Good evening ladies and gentlemen, This is your captain speaking. We have a small problem. All four engines have stopped. We are doing our damnedest to get them going again. I trust you are not in too much distress. Moody decides to put his jet into a highspeed, powerless descent in an effort to get a better flow of oxygen to his passengers (and to his First Officer whose mask is not working properly). A key side benefit from this rapid descent—during which Moody trades height for oxygen—will not be known until the failing engines are examined two days later. At one point in the descent, Moody reduces the altitude of his plane by 6,000 feet in one minute. Passengers believe they are about to die. If nothing happens to change their predicament, the jet will hit the South Java Sea in less than thirty minutes. Despite their own fear, and having to deal with a descending plane at about 40 degrees off-lateral, flight attendants walk up and down the aisles, reassuring their passengers. As the unpowered plane rapidly descends, it sounds—to the passengers—worse than frightening. The noise of the aircraft was quite severe at one time. We thought the screaming wind - and it seemed like it was going to break up, rocking all over the sky and [a] horrible feeling. Eric Moody calmly manages his unpowered 747, without showing any signs of fear, for 12 minutes. During that time, the "City of Edinburgh" (the plane's name) descends from 37,000 to 12,000 feet. Roger Greaves (the First Officer) and Barry Townley-Freeman (the Flight Engineer) keep trying to restart the engines. They are hampered by non-working speed indicators—meaning they have no idea how fast G-BDXH is flying. They need to know the jet's speed so they can gauge when to attempt an engine-restart. To workaround the lack of functioning speed indicators, the Captain climbs, then dives, his plane. This produces a violent, bucking-like action which further frightens the passengers (but might help the flight-deck crew to restart the engines). Greaves and Townley-Freeman try and try and try to restart the engines. Nothing happens. They shorten the prescribed protocol, for engine-restart procedures, so they have more chances to get them going. Nothing changes. Then, at about 12,000 feet (or so), Engine 4 restarts. Engine 3 comes alive next, followed by engines 1 and 2. Ending the plane’s drastic descent, once the engines are running again, Moody returns his 747 to straight-and-level flying. Air traffic controllers, at Jakarta's Halim airport, direct Speedbird 9 to climb to 15,000 feet (so they can get a radar visual of the plane as it flies above an 11,000-foot mountain range). This altitude-changing action, however, causes the strange lights—resembling St. Elmo's Fire (or discharges of static electricity)—to reappear around the plane. The change-in-altitude also produces another danger. Engine 2 backfires, violently, and has to be shut down. This leaves the plane with three operating engines, just before landing. Speedbird 9's problems are far from over, however. Due to massive windshield damage, Captain Moody cannot see anything in front of him. Given that problem, how is he going to safely land the plane? Worse, the crew has to land manually since the airport's ILS (instrument landing system) is not working properly. With the airport's glide slope (which guides a pilot's descent to the runway) out of commission, and his windows completely opaque (except for about two inches along each side), Moody must make a blind landing. The First Officer helps by calling-out the plane's altitude from the altimeter (which had previously proven unreliable during the ongoing crisis). Able to land and stop the plane—after it "kissed the Earth" (to use Moody's words)—the Captain relinquishes control to a towing crew. He cannot taxi because he cannot see through his apparently damaged windshield. Worried they had done something wrong, to cause this near-catastrophe, the three officers inspect their plane on the ground. They are stunned to see their windshield deeply scratched and metal showing on the fuselage (especially on G-BDXH's leading edges). The plane's skin appears sandblasted. It isn't until two days later, after an expert strips-down and examines three of the Rolls Royce engines (numbers 1, 2 and 3), that anyone understands why the engines failed. Badly scratched and scored, by sharp-angled and abrasive particles, they had been choked by volcanic ash (as depicted in this BBC graphic). Did these penetratring particles also cause the engine flame-outs? The answer, according to the examining expert, is "yes" (as explained in the embedded video below). In short ... it's about 2,000° F inside the engine. Volcanic ash melts at 1300° F. As the molten ash becomes a sticky, molten glue, it finds its way into the engine's core where it adheres itself. This causes a fundamental disturbance of airflow into the engine. A disturbance in the engine's airflow causes too little oxygen coupled with too much fuel. This leads to a backfiring engine—and the jets of flame which the passengers saw—and then a flame-out. Because—actually only because—enough of the molten, volcanic ash had cooled, solidified and then was wind-blown out of the engines, during the plane's steep descent, were the engines able to restart. Had Moody not put his plane into its steep descent, the outcome for the plane—and the 247 people aboard—could have been very different. ...within six months of the incident he noticed that the tip of his quiff had turned white. Within a year the rest of his hair had done the same. Moody and his crew received many well-deserved honors and accolades for their incredible courage and flawless airmanship. To this day, the now-retired Captain is consulted when disturbing events, involving airplanes, occur. And ... to this day ... the Galunggun Gliding Club—formed by Moody after the near-disaster ended well for 247 people and their families—meets annually. What happened to the plane itself? It was patched-up, given new engines and ultimately sold to European Aviation Air Charter who kept her in service until 2004. When the bird was scrapped, in 2009, Eric Moody was given the Captain's yoke—a fitting reminder of the courage he consistently showed while firmly holding that yoke and controlling the plane for which he had ultimate responsibility. Screen shots—from Air Crash Investigations Mayday 04x02: "Falling from the Sky British Airways Flight 9"—depict CGI (computer-generated imagery) of BA Flight 9 as the 747 is impacted by volcanic ash while en route to Perth, Australia from Kuala Lumpur on June 24, 1982. Bos, Carole "St. Elmo's Fire - BA Flight 9 Avoids Catastrophe" AwesomeStories.com. Apr 09, 2017. Apr 24, 2019.